(Trent Nelson | The Salt Lake Tribune) Utah Royals at practice in Sandy, Tuesday March 20, 2018. Gunnhildur Jonsdottir (23), right, chases the ball. 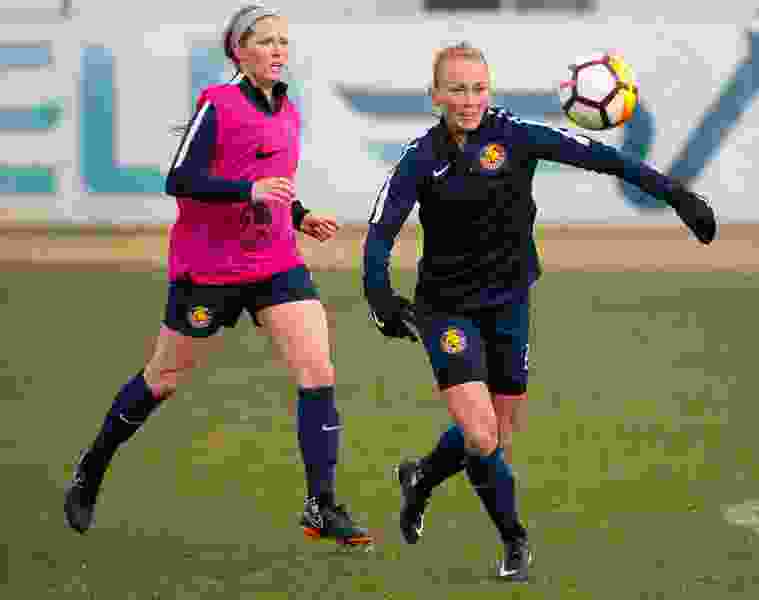 Utah Royals midfielder Gunnhildur Jonsdottir flew in the air, her right leg swept out from under her as her calf took the force of Orlando forward Sydney Leroux’s attempted shot. Unlike the last hard hit she took two minutes prior, Jonsdottir didn’t get up right away. Royals trainer Emily Fortunato rushed onto the field, and as she examined Jonsdottir’s leg she asked if she wanted to leave the game. Jonsdottir, the 29-year-old Iceland international, introduced herself to the league with a goal in the third minute of her NWSL debut last weekend, helping the Royals secure a point from a 1-1 draw at Orlando. The NWSL community took notice, voting it goal of the week. Some film and one phone conversation with Jonsdottir over the offseason was all it took took for Harvey to know she wanted to bring the hard-nosed midfielder to Utah. 🥁🥁🥁…Your @NWSL Goal of the Week winner is Gunnhildur Jónsdóttir!!! Jonsdottir never planned on playing professionally in the United States. She worried it was too different from Europe and it would make it more complicated to play for her national team. Then last season, while playing for Norwegian club Valerenga, she roomed with goalkeeper Michelle Betos. According to Jonsdottir, Betos, who has since returned to the NWSL to play for Seattle, told her the American game would fit her well. By the time Harvey got Jonsdottir on the phone, she has begun to seriously consider the move. Once in Utah, Jonsdottir established herself as a strong personality on the team. When the Royals entered their locker room for the first time, Jonsdottir pulled the new monogrammed bath robe from her locker over her clothes, folded her arms, and leaned back into a dance. During one preseason training session in California, midfielder Katie Bowen remembers, Jonsdottir kept tripping over the ball and falling down, so eventually she embraced it and lay in the grass, joking that she’d given up. “She’s always the life of the party, always smiling,” said Bowen. Harvey predicted Jonsdottir would be the first to score, and she made good on that prediction within three minutes of the Royals’ inaugural match, sliding ahead of the defender and finished an arching cross from Diana Matheson. For a split second there was silence. Jonsdottir proved Betos right, the American game did suit her.